Buffalo, NY, April 5, 2013 - Beachgoers in the Great Lakes region may have noticed an increase in the number of birds and fish that have washed up along the shore in recent years. The primary culprit for these deaths, type E botulism, has been responsible for a growing mortality rate among the fish and bird populations that call the Great Lakes home. A new manual is available to help beach managers combat the spread of type E botulism and provide the public with steps to protect themselves and their pets. Outbreaks, which may have happened along Chicago’s lakefront as recently as August 2012, are believed to be caused when a variety of environmental factors occur at once, including warmer water temperatures, oxygen-deprived conditions, and a suitable source of nutrients. The botulism bacterium creates a toxin in these favorable conditions, which is then passed up the food chain as birds and fish consume animals already infected. In New York’s waters, New York Sea Grant (NYSG) Coastal Education Specialist Helen Domske says “Botulism outbreaks of the Great Lakes have taken a toll on some fish and bird populations. It is important for managers and the public, especially those who fish, hunt or live along the lakeshore, to be familiar with the impacts of botulism." 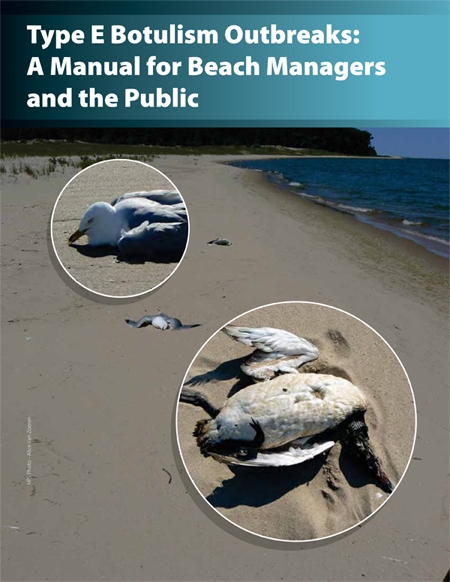 Type E Botulism Outbreaks: A Manual for Beach Managers and the Public provides a detailed look at the biology of the naturally occurring bacterium—Clostridium botulinum—that causes botulism, including where it occurs and how it is transmitted. The 32-page publication provides specific guidance for detecting and reporting infected animals, as well as the removal and handling of dead fish and waterfowl. And although type E botulism poses little threat to human health, the manual also describes basic handling and cooking precautions that consumers can follow to further reduce the risk to themselves. The manual was created by the U.S. Environmental Protection Agency’s Great Lakes National Program Office, assisted by IISG, to meet outbreak management needs identified at the 2008 Great Lakes Basinwide Coordination Workshop. For more information on efforts to strengthen botulism management and reduce the spread of the toxin, visit www.glrc.us/initiatives/botulism. To read Type E Botulism Outbreaks: A Manual for Beach Managers and the Public, click here (pdf) or visit www.iiseagrant.org/catalog/glh/botulism.html. Additional information about Botulism in Lakes Erie and Ontario is also available via New York Sea Grant's related site, www.nyseagrant.org/botulism.